Several years ago, while doing research for a Bible study class, I ran across a chat board run by atheists. Most of the people there were extremely intelligent, however, most espoused the same atheistic talking points. One of the lines I've heard over and over since I first stumbled into that chat room is, "More people have been killed by religion or in the name of God than anything else." This is Atheism's big lie against religion. It always amazed me how people simply nodded their heads in agreement every time this lie was spewed. I, too, was like a dimwitted bobblehead when it came to this subject. "Oh yeah, the Inquisition, the Crusades. If people didn't believe in that silly sky god, we'd be so much better off. Organized religion is horrible." I'll address organized religion in a future post. Right now, I want to concentrate on the death tolls of human events - mano-a-mano. I spent several hours scouring websites for data that was footnoted or had supporting documents. I ignored the hyperbolic numbers uttered on emotionally written sites. 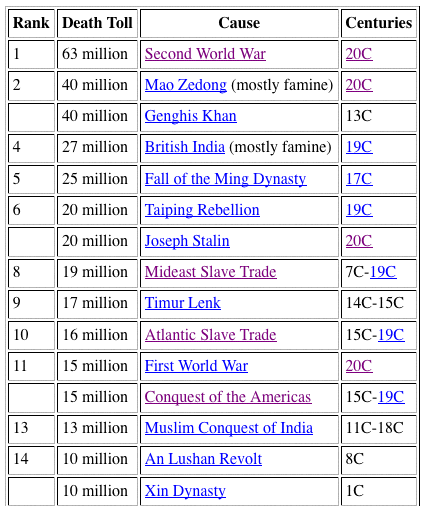 Below is a list of the top 15 events in history that have exacted large human death tolls. Deaths from disease and plagues are not included in this list. This website is very well documented and you can dig deeper into any of these calamities. Click here. Scroll down and you'll find the complete list of the Top 20 Worst Death Tolls. Another list is available on Wikipedia. It gives ranges of death tolls, because exact figures are hard to determine. When you get real figures, it shows that World War II was the most costly mano-a-mono event in human history as far as lives lost. Figures range from 54 million to 60 million deaths worldwide. The Black Plague or Black Death claimed almost a third of the population of Europe in the 14th Century, with a death toll in excess of 100 million people. Wars and governments caused the greatest number of casualties until you get to the Muslim conquest of India - which claimed approximately 13 million lives. On the Wikipedia sight, the first religious war listed was the Holy Roman Empire's "Thirty Years War" from 1618 to 1648. Between 3 million and 11.5 million people died, a long way off from the death toll of the 2nd World War. A favorite religious borne tragedy that atheists like to whip out are the Inquisitions. Inquisitions were carried on over about a 100 year period. One site claimed that 5 million people died during that period. PBS has been running a series called, "Secrets Of The Inquisition." The Catholic Church had kept the transcripts of the Inquisitions secret until 1998 - when they were released to scholars. About ten years later, the information was opened to the public. According to the PBS program, the Spanish Inquisition was the bloodiest of all of the Inquisitions. Approximately 19,000 trial transcripts were uncovered - 12,000 of those tried were sentenced to death. The Papal Inquisition, which was carried on in northern Italy, in and around Venice, claimed between 3,000 and 5,000 lives. Other Inquisitions during that one hundred year period did not rival the Spanish and Papal Inquisitions as far as deaths. Even with a broken calculator you can't get close to the 5 million deaths reported on that one site. Yes, people have died in the name of religion throughout time. A big part of the reason was that in the early centuries, religions were the government. Imperialism, mixed with religion were the driving forces behind many of the conflicts. Regardless of the reason, it does not excuse the cost of human lives taken in the name of religion. But secular man has been much more violent toward his fellow human beings - and that is a fact. When you get in discussions with atheists, you need to be prepared. Do your homework. So, now you know atheism's big lie against religion - more people have died in history because of God and religion. Tell them the facts and move your argument on to a different point. Hi Roger, good writing, however, keep in mind the population was much lower during the 30 Years War than at the time of the Second World War. It's an interesting question: Who's the most bloodthirsty, politicians or priests? Maybe religious politicians. That's a good comment. Context and relativity are not accounted for in these numbers. Although, if you look at the Wikipedia chart, it does show in the far right column the percentage of the population. Thanks. WW2 was sectarian (Catholics, Lutherans, pagan mýstics against Judaists and atheists), not secular. There were also the MesoAmerican, Britannic, Armenian, and Cànqhànij massacres. Google "How many has God killed?" The Germans were led by a dictator that practiced religious oppression. But he also was trying to expand the scope of German influence in the world. Religion didn't cause WW2. The Japanese fought over trade and imperialism. No God there. You can keep your site. I've looked at dozens of them. Their numbers are more inflated than the price of gas. I did a lot of homework to find those numbers and look at everything. Not only is your list misinforming your readers with the information you do present, it also ignores many thousands of wars, killing in the millions of people from the forced conversions of Greeks and Greek philosophers and many other so-called pagans of the Roman Empire, and beyond, by Constantine I and Theodosius I to and through the Crusades, Reformations, schisms, etc. too numerous to list. And do I even need to go into the Papal Bulls that institutionalized and industrialized the enslavement of indigenous peoples places like Africa and the Americas. How about the convert or die decrees? Should I go into those? Considering this religion is based on the Christian deity which is supposedly triune, then all the atrocities committed going back through Hebrew history in its name can be counted as religious crimes against humanity via the same religion, as well. I don't even need to count the Muslim vs Muslim crimes, but I could. And even this view ignores all those that died indirectly because of Christian beliefs about hygiene, bathing in particular, during the first millennia of the religion, and the rejection and destruction of institutions of learning, libraries, and medicine, probably billions of people died due to disease, plagues, etc. for this reason alone. Taking into account the fact that religion is merely a political tool to motivate the ignorant through fear, and as such, tightly intertwined with their country's governmental systems, it is also fair to conclude that there are many wars or invasions that would not have happened were it not for the personal choices that were religiously motivated. Not to mention that never has a Commander screamed, "Come-on men, charge that wall! Who cares if God is on their side in this one!? No, they would not do that would they? Pathetic if you think about it. Many people don't realize, do to Christian disinformation in regards to the Russian Revolution, that the reason the churches were closed and priests imprisoned and many killed was due to the complicity of the Russian Orthodox Church in the counter revolution against Communist government. And some 20 million died fighting the Christian Nazis in WW2. Billions, literally billions of deaths are directly attributable to belief in your deity. One phrase you need to burn into your skull: The chosen people of God. This one phrase has killed more people than everything else combined. How, let me give you an example: Hawaii 1819, 23 par of Missionaries come to the Big Island to spread the word, but they spread something else--disease. Four million Hawaiians died of Measles alone. Less than 75,000 indigenous inhabitants survived the discovery of the Islands by Europeans. Multiply that times however many missionaries there have been throughout history's Christianization and you get my point. No, you either have no idea what you are talking about, or you are another Christian lying for Jesus. Either way, this blog is a waste. Oh, one more point, anyone that has read Mein Kampf knows, without a doubt, that WW2 was a religiously driven war. In fact, the full translation of the title of Hitler's first book is "My Struggle Against the Lies of the Jews." And his second, "Table Talk" doesn't even leave any wiggle room at all concerning his motives. And your interpretations of other death tolls seems every bit as flawed. Christian propaganda, nothing more. Thank you for you comment. I appreciate all points of view. However, I spent a lot of time researching the numbers for this post. I checked over a half a dozen website to compare numbers. The numbers are as accurate as you can get. Some of your examples fall pitifully short and are as misguided as you claim I am. What does a group of missionaries with the measles have to do with religious persecution. They could have been farmers. They were people with a disease and it proved fatal. I fail to see the oppressive nature of a religion based on a common disease that was not figured out by science and medicine at the time. Also referring to the Christian Nazi's and Hitler's motives. The Jews have a religious belief, but they are also a race of people, just like blacks or Asians. Hitler's motives were to promote his Aryian Race and wipe out the Jewish race, not eradicate religion. And even if it was, that is not religious persecution, it is persecution of people with a religious belief - the Jews were victims - not unlike the black slave trade. Both the whites and the blacks had religious beliefs, but the bottom line was labor and commerce. All of those people ate food. Does that make food-eaters an evil menace to society? Your claim that probably billions died due to misguided hygiene policies and inaccurate health knowledge. First, you're overextending the world population at the time. 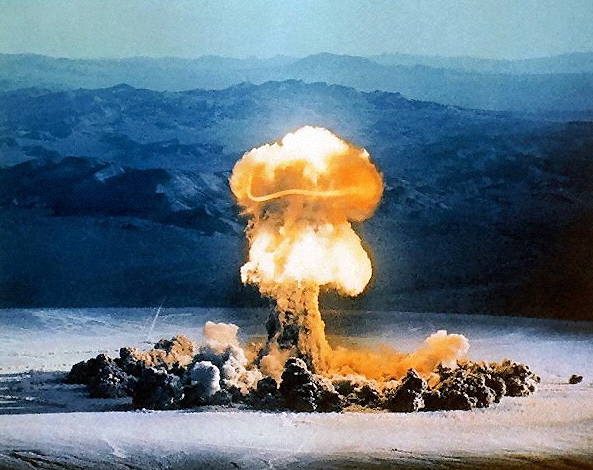 If billions were killed, then the human race might have been eradicated. In addition, you are correct the churches were the primary governmental influences of the time. However, their SCIENTISTS did not offer better alternatives to disease, diet, health maintenance. The practices of the time were the "best practices" based on the evolution of medical and scientific knowledge. In retrospect, it is easy to criticize a methodology, but you have to look at it in context. That is what they had. How long was "bleeding" a patient thought to be the right treatment? That was not a religious practice, but it killed more than it helped. Two last points... Why is it when someone who identifies as a Christian is pushing propaganda, but the "Free Thinkers" of the world are not? There is no proof to your counter claims, only an attitude of disbelief. And contrary ideas are welcome here. You can come back any time - Not quite the reception I've gotten from the atheist crowd. It's usually, "Get the F out of here" - even if all you seek is discussion. Lastly, your comment, "Either way, this blog is a waste." This sums up my problem with the atheist, "Free Thinking" community. I have published over 350 posts on this blog. 2 deal with atheism. about 5 question the existance of God and how God and faith fit into our lives. One specifically attacks zealous Fundamentalist Christians who do persecute people who don't believe the way they do. To trash my entire blog based on one post you don't agree with - and you've probably labeled my site a "Christian Blog" - which couldn't be farther from the truth - just shows how narrow minded the atheist mindset it. I run into it all the time. You can't look at the big picture, but choose to find one point to try to discredit someone. One post and this blog is trash? Ironic. Please don't ever refer to yourself as a "Free Thinker" or an "Enlightened" of "Truth-based" individual. When you look at 2/10th of 1% of a body of work and trash it, you're not very broad minded. However, thank you for you feedback. I always appreciate a civil discussion. Best of luck to you. If you could just be honest for a few minutes, perhaps you could explain why you have excluded the 63 million death in WWII when, as a cursory reading of history would tell you, the prime causes, or at least major contributory factors, were German Catholicism and Japanese Shintoism. Of course, I'll understand if you feel you can't be honest enough in case an imaginary magic man gets you for it. It's very clear in you reply to Beachbum that you have little interest in truth. Paying what lip-service you do pay to it is merely there to cover what amounts to nothing more than a disinformation site designed with the intention of misleading people about the true nature of theophobic superstitions. Perhaps you could explain whether your intention is to mislead people for your own personal power trip, or whether you're doing it as some sort of attempt to persuade yourself that your superstition has some basis in reality as part of some concerted attempt to maintain a self-delusion you realise you need to work hard to maintain. Rosa, I researched my numbers on about 1/2 a dozen sites. I was not interested in being inaccurate. I stand by the numbers. As far as the Catholic bent to WWII - after reading dozens of books about WWII - watching hundreds of hours of movies, PBS specials, documentaries, the only two times I have heard that WWII was a "religious" war was by you and another atheist. First time in all those years. If you want to believe that WWII was a religious war, you're entitled to do that, but that is not my belief. And I think I can get a thorough agreement on that. If you want to talk about truth and accuracy, you need to start harping on your atheist bretheren who produce websites that state MILLIONS of people were killed during the Spanish Inquisition and dozens of other hyperbolic numerical fantasies - just to ply their case. Yes, I seek truth. I'm not on a power trip. I'm on a mission to correct the lies purported by a handful of zealous atheists who are trying to paint an unrealistic picture of the facts. You're entitled to your beliefs, and that is why I published you comments. All viewpoints are welcome here, as long as they stick to facts and figures and refrain from belittling someone. You've been extremely acerbic in the past and this time you seemed more even keeled, so your comments are there for those to ponder and discuss, as are mine. The only decent argument I've heard about religion and the death tolls is the relative percentage of world population at the time. However, there are not enough thorough census figures on world population, so that percentage is hard to calculate. That might have a valid argument against my stance. If it can be proven, then we can go with that. I appreciate your input and you are welcome to add more to these comments.